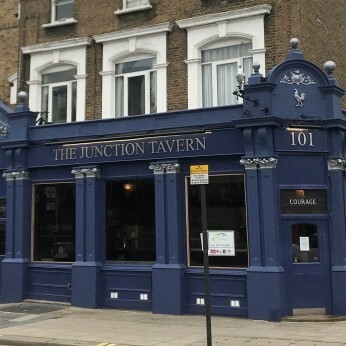 The Junction Tavern is an imposing Victorian building in the heart of North London. Dating back to 1885, the main bar and dining room reflects its late Victorian heyday, but with all the modern comfort and facilities of a great British pub. Plum in the middle of Kentish Town and Tufnell Park, its 18th century frontage veils a TARDIS-like interior of dark-panelled rooms, a bright and airy conservatory and an award-winning beer garden. We're really sorry but we don’t seem to have any offers or events for Junction Tavern. We're sure there must be something happening here but they just haven't told us about it! Please do mention this to Junction Tavern when you next visit them.